We realize that most people do not move every day. If you want help loading, we have everything from an extra strong back to white glove service. 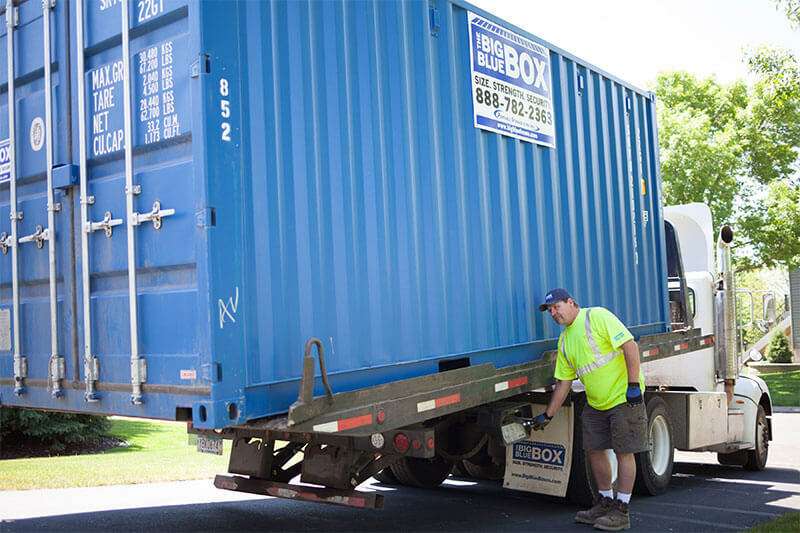 If you want to load your container yourself, here are some moving storage tips to minimize damage to your household goods and to make your move go as smoothly as possible. Pack boxes so they are full, but not too heavy so you can move them around. The more things you load into boxes, the easier it is to make things fit in the container. With all boxes, make sure your items are protected by wrapping them, or filling boxes so nothing can move. If you leave open spaces, things will shift which may chip, dent or break the contents of the box. Use extra packing paper to fill in any open areas in boxes. Tape the bottom of all boxes so they do not fall open when you pick them up. Mark boxes so you know which room to put them in when you get to your new house. Pack heavy or dense items, like books, papers, etc., in smaller boxes so they are easier to manage. Pack large, lightweight items like linens, pillows, and sofa cushions in garbage bags. Make sure you close the bags tightly. Use those bags for filling in spaces when packing up your container. Keep valuables and essentials with you. If you are storing your container at our site, make sure you keep all financial records and other important documents with you. There is a good chance you will need these items in the process of closing on your new home. If you still have the original boxes, use them for moving your electronics. Separate electronic components when packing and make any notes necessary to help you put them back together again. Put all cables and extra pieces together in one bag per electronic item so you know you have all the necessary pieces for reassembly. If you are storing your container at our site, think about the temperature variations. Most household electronics (toasters, microwaves, etc.) are fine in our containers. If you have any questions, call the manufacturer. We do NOT recommend storing flat-screen TV’s in our containers. Take apart whatever furniture you can. Tables are much easier to move when you don’t have to maneuver through doorways with the legs still on. Make sure you wrap up any screws or nails in a bag and tape them to the bottom of your table. Dining room tables should be taken apart. Wrap the table top in blankets and secure onto the side of the container. Do not set the table in the container and load things around it. If the table does not come apart, wrap the top in a blanket and turn it upside down. Take care that you do not load items that will snap the legs off. Wrap furniture in moving blankets when putting them in the container. Do not put tape or straps directly against furniture. Check out our moving supplies page for blankets. We recommend having pianos moved by specialists. Please let us know if you have a piano and we can help you arrange to have it moved. We offer dish and glass packs for wrapping glasses and dishes individually. The packs have partitions to make packing even easier. See our moving supplies page for details. Wrap fragile items in packing paper. Before you start loading a box, fill in the bottom and sides with a few inches of packing paper. Pack glasses close to each other and fill in extra spaces with paper, wrapping each item individually. Put another layer of padding at the top of the box. Mark the outside of the box fragile. Wrap dishes individually in paper. If you have a dish pack box, line the bottom with paper and then stand the plates on their edges, adding padding along the sides of the box. Use potholders and kitchen linens in between dishes for extra padding. One dish pack box should hold a full set of dishes and bowls. Pack silver in cloth or silver paper. Collect rakes, shovels and other garden tools with long handles. Tie the handles together so you can carry them together. Store these items in the top empty space of your container, placing them carefully to avoid damaging other items. Drain gasoline and oil from your lawn mower, chain saw, weed eater, and any other equipment that runs on gas. Disconnect batteries from any equipment. Do not pack your propane tank for your gas grill. You cannot store propane in our containers. Tie or bind your grill shut, securing any loose items. Do not pack any hazardous, noxious, odorous, waste, toxic, explosive, illegal, stolen, poisonous, flammable acidic, contaminated, unsanitary or dangerous material in the container. This includes, but is not limited to, gasoline, oil, propane, paint, varnish, paint thinner, insect and rodent poisons, liquid bleach, toxic cleaning products, aerosol cans, firearms, ammunition, or waste. In addition, do not store perishable foods, food in glass jars, live plants, pets or matches. We do not recommend loading candles, tapes or photos if you are storing over the summer. Moving furniture and boxes can take a toll on your body. Make sure you always lift with your knees. If it is extremely hot or cold while you load your container, make sure you take frequent breaks. In summer, stay hydrated. Before you start loading your container, make a plan. Our containers can be picked up from either end, so there is no front or back. To protect your belongings, we recommend that you put a buffer at either end of the container. This can be a sofa or bed, or some other softer furniture item that you put in the far end of the container. If your sofa is strong enough, consider putting it on its end to save space. Keep a buffer to put in front of the doors. Many people find using beds particularly useful as they want to sleep on the mattress until the last minute, and want them first thing at their new home. There are tie-down loops along the floor and ceiling of the container. To use them, wrap large appliances or heavy furniture in a blanket and put up against the wall of the container. Secure a rope (we recommend nylon rope so you can simply cut it when unloading, no need to find and untie at that point) in one of the loops and then criss-cross over the furniture, securing it in place. Test it by trying to push the furniture or appliance toward the door or other end of the container. Once your largest and heaviest items are secured in the container, fill with the rest of your furniture and boxes. When you are stacking furniture and appliances close together, protect them with blankets. For sofas, chairs, mattresses and other cloth-covered furniture, consider a sofa or mattress bag. We have both available for purchase. See our moving supplies page. Make sure you pack the container so that nothing can shift side-to-side or front-to-back. Use blankets, cushions and other odd-sized soft items as fillers. Make sure fragile boxes are packed carefully and that nothing heavy can fall on them. While our containers are great for holding household goods, there are some things we cannot allow you to pack in your container. Hazardous materials are not allowed. They include any hazardous, noxious, odorous, waste, toxic, explosive, illegal, stolen, poisonous, flammable acidic, contaminated, unsanitary or dangerous material in the container. This includes, but is not limited to, gasoline, oil, propane, paint, varnish, paint thinner, insect and rodent poisons, liquid bleach, toxic cleaning products, aerosol cans, firearms, ammunition, or waste. In addition, do not store liquids, perishable foods, food in glass jars, live plants, pets, or matches. If it can spill or freeze, do not put it in your container. We do not recommend loading candles, tapes or photos if you are storing over the summer. We do not recommend storing flat-screen TV’s in our containers. If you have any questions about an item, please call the office or the manufacturer.